The first activity on the Montserrat Annual Festival calendar is less than one month away. The updated schedule shows more than 30 events with more to come as private promoters finalise their plans. The fourth annual MAC4 Exhibition opens on Monday, December 3 at the Montserrat National Trust. No official word on the four featured artists, who are all residents, working in different media. For the first time in three years, all three pageants are on the calendar. The St. John’s Action Club will host their Princess Show on Sunday, December 16 at the Cultural Centre. Sunrise Productions is back with the Teenage Pageant the following Sunday, December 23 and a Miss Montserrat will be selected in the show now called Crowning of a Queen on Friday, December 28. There are many community events on the programme. Ryllicious D’Lites is hosting a Watersport & Fun Day on Saturday, December 15, Small Beginnings is holding their first event as part of the annual festival on Tuesday, December 18. Emerald Community Singers will present Behold the Star on Wednesday the 19th and the Nurses’ Concert will be on the following day. 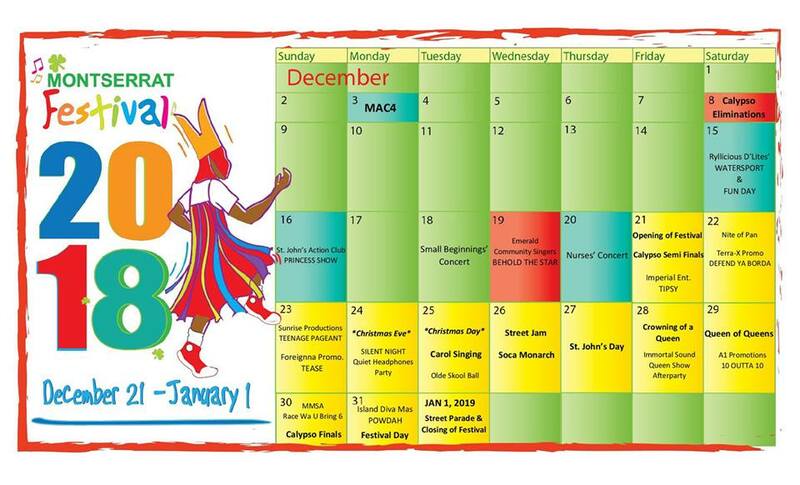 Carol Singing on Christmas Night, Soca Monarch on Christmas Eve and St. John’s Day events are all in the final week of activities. The regional female calypso show Queen of Queens is on Saturday, December 29 and the Calypso Finals on Sunday, December 30. Festival Day follows on the 31st and Parade Day falls this year on New Year’s Day. There are several after parties after many of the major shows. See the calendar for more details. The Montserrat Annual Festival is organised by the Montserrat Arts Council.